Executive Director of Gitana Productions Cecilia Nadal has been named the 2017 Ethical Society of St. Louis Ethics in Action Awardee. “Ms. Nadal embodies the Ethical value of bringing out the best in the human spirit,” Ethics in Action Award Committee Member Stephanie Sigala said. Throughout her career, Cecilia Nadal has focused on helping underserved and disadvantaged members of the St. Louis community as a teacher and a counselor. Hear her March 2017 Platform presentation. 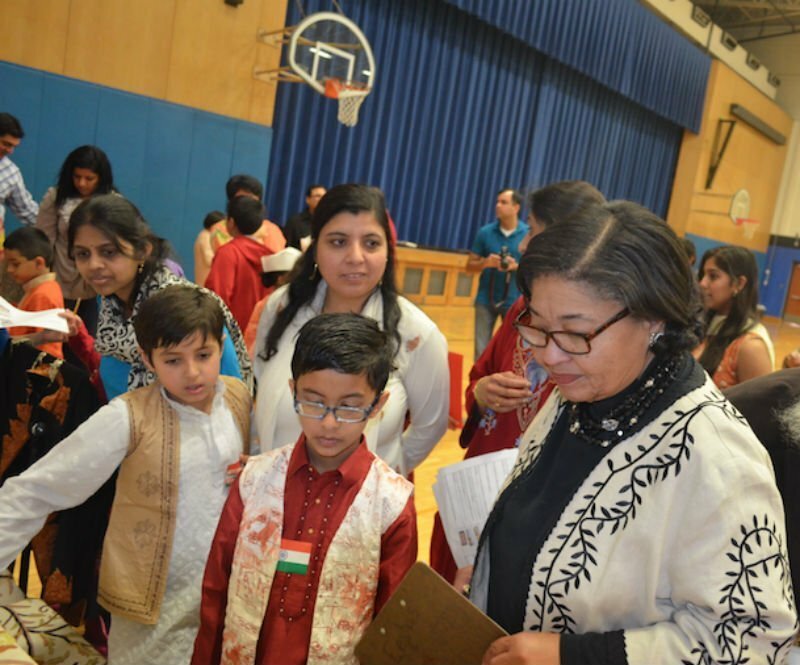 Ethical Society of St. Louis Ethics in Action Awardee Cecilia Nadal, far right, acts as a judge for the Balvihar Cultural Center following her five years of collaboration with the Indian Community. For 23 years, Nadal was the founder and president of Productive Futures Inc., an employment agency for immigrants and the long-term unemployed. In 1996, Nadal founded Gitana Productions, which uses music and theater to bring diverse cultural and economic populations together. 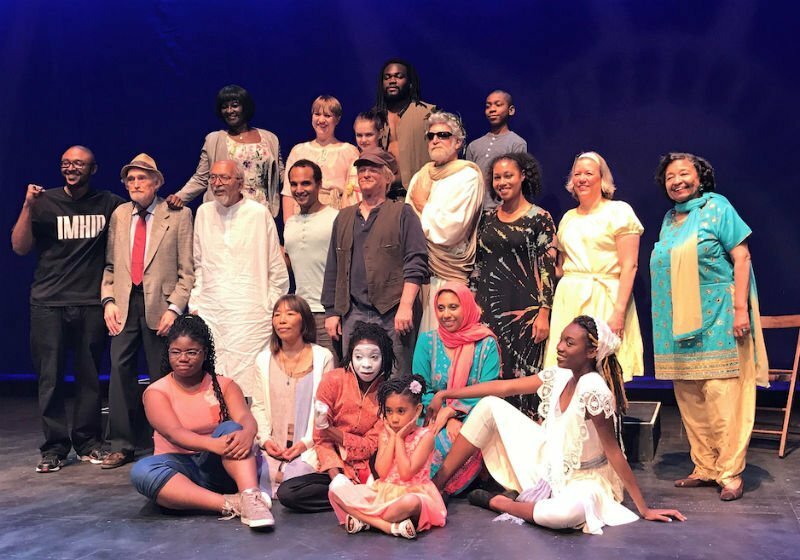 “Gitana was the region’s first arts organization with a focus on cross-cultural engagement through the dramatic arts,” said Nominator Betsy Cohen of St. Louis Mosaic Project. 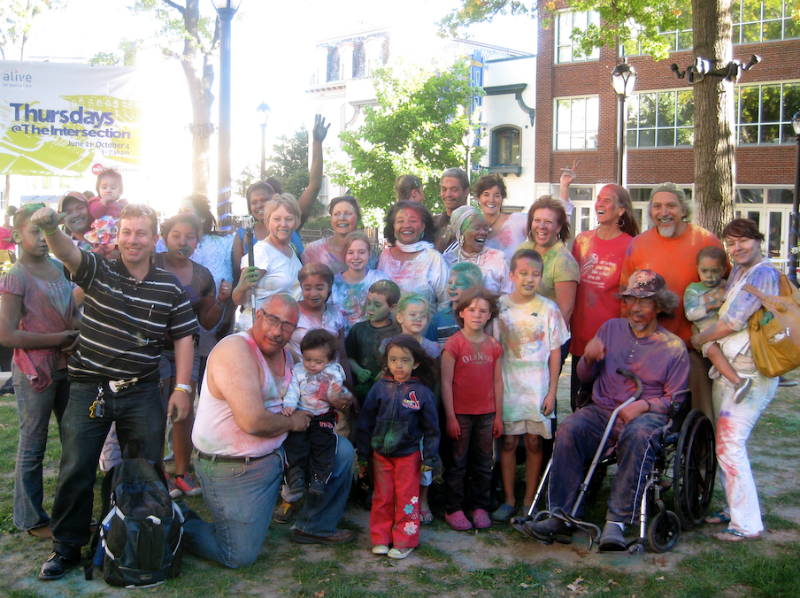 Gitana’s initiatives include co-creating concerts and original theater programs with the Latino, Chinese and Indian communities always including both the advantaged and disadvantaged of St. Louis. Since 2007, Gitana has conducted Global Education through the Arts, a community arts program in South City that brings together refugees/immigrants and African American youth who often live in the same neighborhoods but have no ambassadors between them. Following the protests in Ferguson, Gitana opened a satellite of the project that has been in operation for three years. Ethical Society of St. Louis Ethics in Action Awardee Cecilia Nadal, far right, poses with the most recent cast of BETWEEN WORLDS: AN AMERICAN JOURNEY at The Grandel. In addition, students act in dramas which are commissioned to foster discussion about social and ethnic issues. Talented students are given the opportunity to work side-by-side with seasoned actors in Gitana’s professional theater and take part in concert performances such as the China National Orchestra concert at Powell Hall and BLACK AND BLUE, an original play about the challenges of the police and the African American community. Nadal has received many awards, including a Woman of Achievement Award in 2010 and a St. Louis Board of Aldermen Proclamation in 2014. Most recently she was awarded the 2015 St. Louis Visionary Award for community impact by an arts organization. Ethical Society of St. Louis Ethics in Action Awardee Cecilia Nadal, center, poses with attendees of the “Celebration of Oneness Festival” in Strauss Park. Nadal initiated the festival, where vibrant color powders were spread over everyone to show oneness. The festival also included international music and dance. The Ethics in Action Committee was impressed by Nadal’s strong commitment to the creative spirit. This commitment rises above ethnic, racial, and economic stereotypes to foster real communication and hence possible solutions to challenging community divisions, according to the committee. “I assume that when people are brought together with diverse worldviews and backgrounds the results of any project or community goal will be better achieved if co-creation is the central strategy. The brilliance of ‘We the People’ is manifested in co-creation,” Nadal said. The Ethics in Action Award includes a monetary stipend. The Ethics in Action Award ceremony will take place at 11 a.m. Sunday, October 1, 2017, at the Ethical Society of St. Louis, which is located at 9001 Clayton Road. For more than 40 years, the Ethical Society of St. Louis has honored compassionate leaders in St. Louis, who try to help the powerless and bring hope and positive change, with the Ethics in Action Award. To learn more about the Ethical Society of St. Louis, visit www.ethicalstl.org. To learn more about Gitana Productions, visit www.gitana-inc.org.